An onsite caretaker is available at (845) 938-2649. The Lake Frederick Recreation area is located on a catch and release only lake, with mountainous views just 7 miles from the United States Military Academy, and 50 miles from New York City. Reservations can be made through the ODR Round Pond Recreation Office. Log Off, Shut Down, And Go Outside! 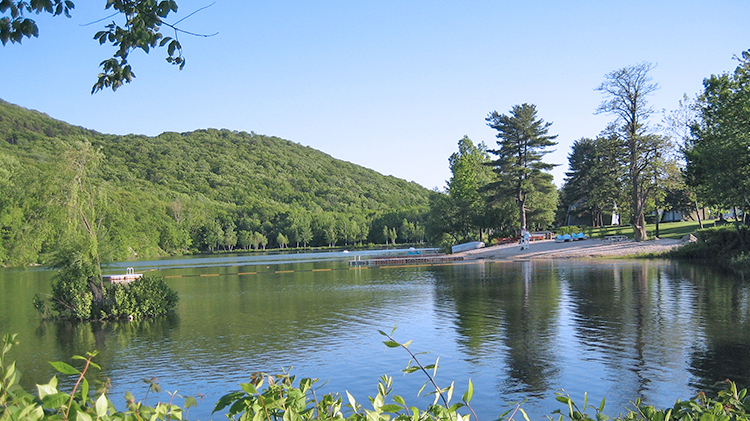 Lake Frederick Recreation Area offers 8 Bunk Houses, 50 Tent sites, Mess Hall, Party Pavilion and bathhouse. Mountain top lake, one ADA fishing pier, swimming beach, and hiking trails are all within walking distance from your site. Our main office offers services to include: firewood, canoes, paddle boats, rowboats and much more. Reserve Today! +1 (845)938-2503, Cancellation Policy All reservations require payment in full. Check-out is at the Lake Frederick Main Office and must be completed by 11am on the last day of the reservation. • 50 tent sites available; No amenities, water or electric. • Reservations will not be accepted for specific sites, Sites determined on a first come first served basis at time of check in. • Cell phone service is not guaranteed. • Maximum length is 27 feet. Meeting/Mess Hall $200 per day (Maximum occupancy: 100) Rental: 9am-9pm. Includes set up and clean up times. Community Pavilion $120 per day (Maximum occupancy: 60) Rental 9am-Dusk. Framed Tent, picnic tables, 110-volt power. Lake Frederick beach is available to Active Duty Military and immediate family members, DoD Civilians and immediate family members, Retired Military and DoD Civilians with proper ID and patrons who are staying at the Recreation Area (Camping, Pavilion Rental; and their guests). In order for all or our patrons to enjoy their stay at Lake Frederick, we ask that you follow our few sensible rules. 2) Bunk Houses, and tent sites are strictly for recreational residency and are not party facilities. Parties may be booked at the Pavilion or Mess Hall (Reserved 9am-9pm). 3) Management reserves the right to relocate or change reserved sites at any time. 4) Check in for tent sites at Lake Frederick is at 1p.m. and bunks at 2 p.m. Checkout is at 11a.m. 5) Upon their departure, campers are responsible for policing the area in the immediate vicinity of the area they have rented. Camping and picnic areas must be kept clean and orderly. Campsites are not to be altered, expanded, or amenities shared/ taken from other campsites. Picnic tables and fire rings are not to be moved. The Sponsor will be responsible for all damages and vandalism to the facility, picnic table and surrounding grounds. A security deposit will be collected at the time of Check-in for the Bunk Houses and Party Facilities. 6) The sponsor booking a site is 100% responsible for their guests and must remain with them at all times. Children under the age of 14 must be supervised at all times. 7) Alcoholic beverages may be consumed in moderation IAW laws established by the state of New York. Intoxicated campers will be asked to check out. MP’s will be called for failure to comply. 8) Quiet time is from 10pm-8am. At this time please keep noise to a minimum and do not have bright lights shining. Campers are asked to respect other campers by not using vulgar language or trespassing in other sites. All daytime guests must leave Lake Frederick by 10pm. Management has the right to ask unruly campers to leave the premises. 9) ATVs, motorboats, motorized scooters, firearms, bows & arrows, fireworks & sparklers of any kind are prohibited. 10) Pets are not permitted on the beach, picnic areas, and Bunks or in the water at Lake Frederick. Pets should be leashed and cleaned up after at all times. Management reserves the right to ask patrons with loud, unruly pets to remove them from the recreational area. All pet owners are required to present paperwork to the office for proof of up to date Rabies vaccine upon request. A boarding kennel is available at Morgan Farm +1 (845)938-3926. 11) Fire in grills provided must be made with charcoal only. Fires in ground pits or fire rings may be made with wood. Open ground fires (no containment system) are not permitted at any time. All fires must be extinguished before you leave your site. Wood or logs for campfires cannot exceed the diameter of the fire ring. ODR Staff has the right to extinguish any fire too large or a safety risk; Example: windy or dry condition. 12) Help us preserve our woods. Please do not cut trees or trim branches for firewood or dig up saplings. Only firewood that was purchased within a 50 mile radius can be brought into the recreation area. Firewood can be purchased at the main office. 13) Well water is available. You must bring your own containers. 14) Swimming is permitted in the designated area within the floating buoy lines only and is prohibited after dark. There is no swimming or wading in the shores other than the designated swim area. Beach open Memorial Day through Labor Day. 15) There must be a person over 16 years of age on all boats and everyone must wear life vests. Swimming or diving off boats, alcoholic beverages and horseplay are prohibited. 16) Persons age 16 and older must have a recreational area daily fishing permit (available at Round Pond) in order to fish at any of the installation ponds, lakes, or streams. Those patrons fishing should always dispose of their trash and not leave fishing line, bait containers or garbage on the shoreline. 17) Outdoor Recreation, the campground, DFMWR, and Army assume no responsibility for damaged, lost, or stolen property during campers stay. 18) Family grills are permitted, not to exceed 20lbs.